Welcome! Chinchilla shows are an essential part of raising chinchillas for quality and health. Reputable breeders from all over the country are well known through the show system and regularly attend to continue learning about chinchillas and to ensure their animals are being bred to quality standards. Chinchilla shows occur all across the United States, Europe, South America, and even Singapore in recent years. Please check below on our list of upcoming shows to find one near you. For further details, you can email me or you can visit each organization's website to contact show chairs directly. Chinchilla shows are conducted as 1 or 2 day events. They are basically beauty contests where the best looking, highest quality chinchilla at the show is picked out from groups of 20-300+ animals. Winning a top award of Grand Show Champion or Reserve Grand Show Champion is a huge feat and a great honor no matter the size of the show. Each breeder will bring chinchillas growing out from their herd to the shows each year. The animals usually go through pre-show preparation including extra dust, extra cage cleaning, and some "rough grooming" which is combing with a wide toothed comb to remove excess dead fur. Each chinchilla is thoroughly groomed and basically fluffed up at a chinchilla show and tails trimmed (to remove any cast from a urine stained tail) and they are put into individual show cages. Once this is done, they are separated into classes according to each organization's show rules. 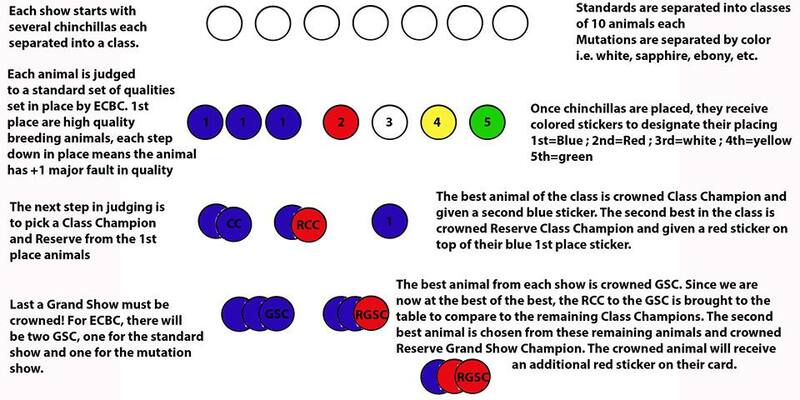 Each class or section has a single animal crowned the champion, a reserve champion, and sometimes there will be a third best depending on the show. 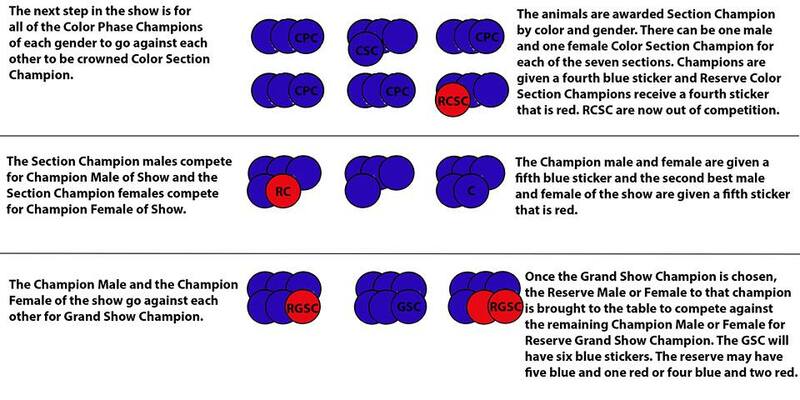 From there, The champions all compete against each other to be crowned Grand Show Champion and Reserve Grand Show Champion. Below you will find two charts I put together to take you through the process of showing in both show systems. 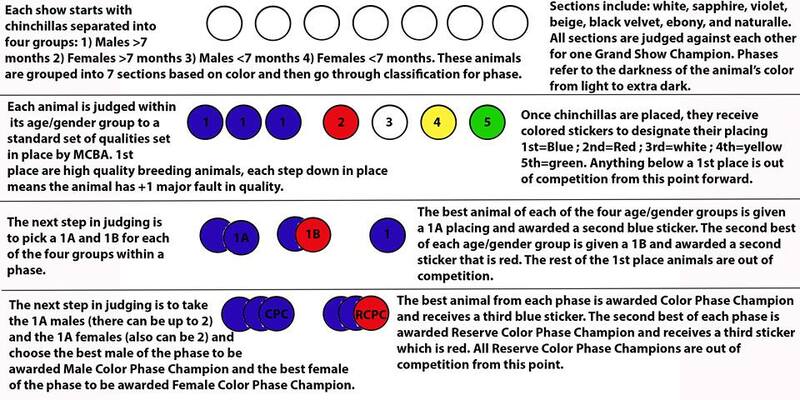 The colored dots indicate stickers that are placed on the show cards to show the placings of the animals as they are judged. Shows within the US are typically advertised through each organization in their monthly or bi-monthly magazine as well as on facebook and their individual websites. Click on the following links for more information on upcoming shows.